There are so many genres of comic books, and storytelling, in general. Pretty Deadly manages to blend multiple genres and storytelling techniques in one beautiful, intricate package. 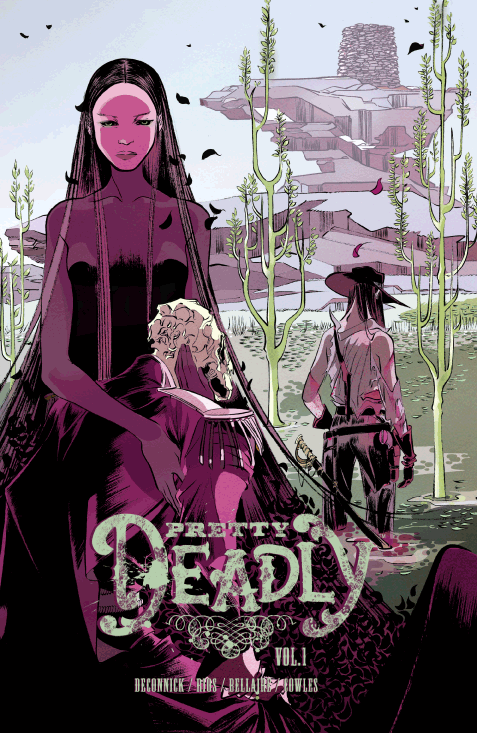 Written by Kelly Sue Deconnick and illustrated by Emma Rios with colors by Jordie Bellaire, Pretty Deadly volume 1 collects the first five issues of the series, and is a story that demands multiple readings, which in this case, is a good thing. 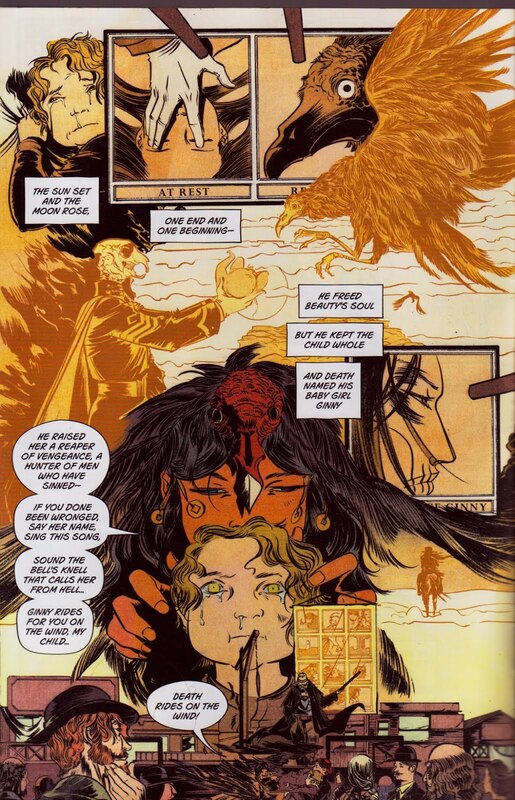 It has a Western setting with both human and mythological characters, wrapped in fantasy and horror. If that seems hard to follow, it sometimes is, but the payoff is always rewarding. The story follows a blind old man named Fox and a little girl named Sissy, as they travel from town to town telling the story of Ginny, the daughter of Death personified, who is on a mission to settle an old score with Fox. While on the run, Sissy learns that she has a greater purpose in life, and demands to know the truth of who she is, why Death and Ginny are after them, and why she is so important. Deconnick weaves an intricate web of vengeance, mystery, forgiveness, the hunt for truth, and finding oneself in a way that’s not often told in the comic book medium. It feels more like an old legend or fairytale being retold 100 years later, which presents readers with a unique and refreshing experience. Every character that is introduced is given time to develop and squeeze their way into the web, and the more you read, the more intertwined everything becomes. The best part about Deconnick’s storytelling here is that every plot point and twist serves a purpose, with things coming together and making sense at the end of each issue, and the whole arc as a whole. Thankfully the story itself is only half of the experience. The art by Emma Rios is absolutely stunning and perfectly captures the dark fairytale nature of the book. Each scene feels like a dream, with lots of swirls and lines and movement taking the reader through the pages in an almost whimsical manner, and the characters are brought to life with their facial expressions and body language. The color palette is reminiscent of a sunset, with lots of reds, oranges, purples and pinks with touches of bright green. Rios’ unique art style combined with Bellaire’s colors really bring home the feeling that you’re experiencing an age-old tale that’s been passed down through generations. Yes. 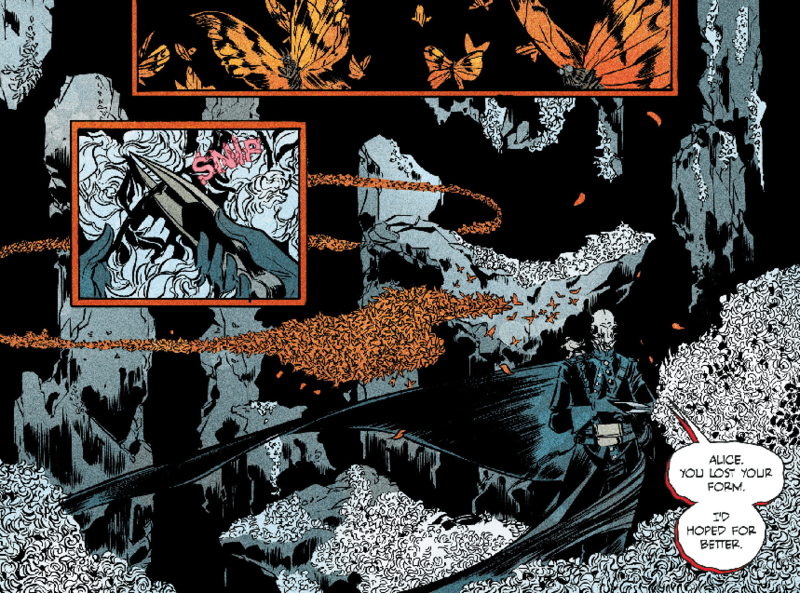 Deconnick, Rios and Bellaire have created a beautiful comic book experience with Pretty Deadly. The story is intricate with deep and flawed characters, and the artwork is unlike anything else, yet so perfect for this book. The first time I read it, I didn’t quite grasp the entire story but I couldn’t stop thinking about it. The second time it was much more clear and easy to follow, and the third time was for pure enjoyment. Like a David Lynch movie, it gets better each time you read it. But don’t let that scare you off – it’s a book that sticks with you long after you finish it, which will likely be at least twice. 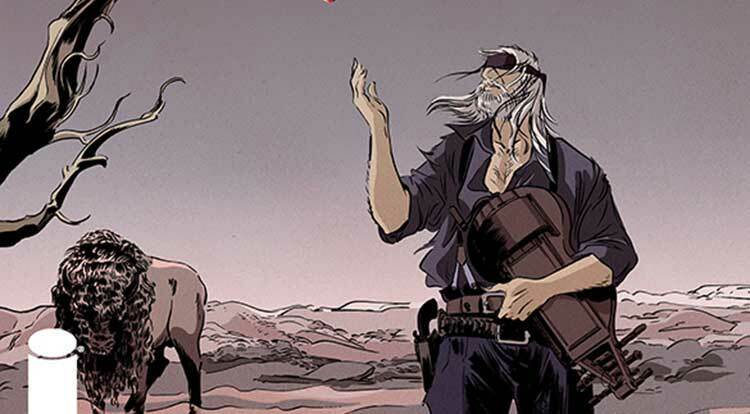 Pretty Deadly is currently and ongoing monthly series, but you can pick up the volume 1 trade paperback that collects issues 1-5 from Amazon.com for around $7, or at your local comic shop.